2. 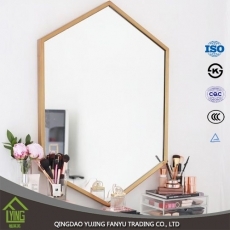 What is the difference between silver mirror and aluminum mirror? 4. Can I get samples to check your quality? 5. Is your company a manufacturer or trading company? 3) There are 2 silver mirror production lines, 1 aluminium mirror production lines, 2 tempered glass production lines, serval imported CNC cutting machines and edge polishing machines, and scores of cutting, edge polishing, cleaning, PE film covering, and packing machines and equipment. More than 30 enthusiastic & professional and sales. Any questions or claims about products will be solved or gotten feedback within one working day. 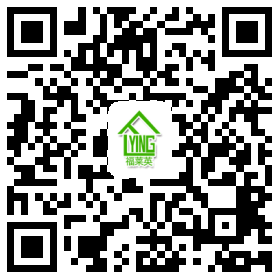 Our products are exporting to the customers in USA, Europe, South Korea, Australia, Middle East, India, Africa, etc. Sizes of silver mirror are 2440*1830mm, 2200*1650mm, 2134*3300mm, 2440*3660mm, etc. 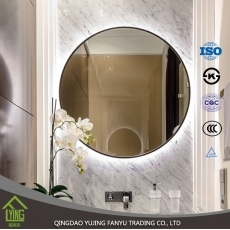 While the normal sizes of aluminum mirror are 914*1220mm, 1016*1220mm, 600*900mm, 1830*1220mm, 1830*2440mm, etc. Thickness of silver mirror are 2mm, 3mm, 4mm, 5mm, 6mm, 8mm, etc. While the normal thickness of aluminum mirror are 1mm, 1.3mm, 1.5mm, 1.8mm, 2mm, 2.5mm, 2.7mm, 3mm, 4mm, 5mm, 6mm, etc. The back coated film of silver mirror is silver; while the back coated film of aluminum mirror is aluminum. 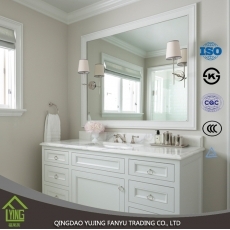 Silver Mirror is usually more expensive than aluminum mirror. The lifetime of silver mirror is longer than aluminum mirror. Our MOQ is 1*20GP. Products of different sizes and specifications could be mixed in one container. Yes, samples can be provided for your reference. 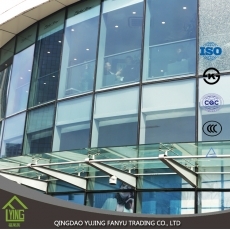 We are a manufacturer of glass and mirror products, and we have our own factory and advanced production lines.